The taste was very sweet. A different kind of sweet, though, and it took me a year to come back around to figuring it out. This variety of apple, along with many other varieties, is susceptible to a “disorder” called watercore. To the dessert grower, this “disorder” is bad news. Most people don’t want to bite into an apple which appears to have a water-soaked flesh because we’ve been taught that anything other than the usual white-crisp-juicy is to be avoided. However! I’m here to tell a different story, potentially one for the watery underdogs. A hopeful cider apple story. Caused by a combination of genetics, the fruit being mature or overly mature, and sunscald due to intense heat. Why is it considered a disease? The brunt of it comes down to long-term storage. Apple packing houses aren’t able to store the apples with severe watercore because the tissues will eventually start to break down, causing the flesh to turn brown (and thus marked as unsaleable). Another reason why it’s a bit of a bother to the apple industry is detection. Aside from some relatively recent research on detection methods, watercore has remained undetectable by the apple industry without the use of a knife (or teeth) to cut into the apple. The area above that looks water-soaked is actually where the apple has flooded its air spaces with a solution of sorbitol, a non-fermentable sugar alcohol which is not technically a sugar. According to Claude Jolicoeur’s Book, The New Cider Maker’s Handbook, sorbitol has a sweetening effect that amounts to about half the effect of white sugar. This means that when a cider or perry (cider made from pears) is fermented dry (the yeast eat almost all of the available sugar and convert it to alcohol), the presence of sorbitol would still have a sweetening effect on the dry cider (because it doesn’t ferment). A long time ago, I was helping out in a cider house and they were sending a finished cider through a sterile (sulfited) filter to both strain the yeast from the bottle, but also to prevent any yeast that managed to slip through from reproducing. I was asked to taste the water being sent through the filter to detect the sulfur taste and the very moment when that sulfur water hit my lips, I was struck with an immediate and very scary asthma attack. That day I learned that I’m in the 1% of Americans who are actually allergic to sulfites and ever since, I’ve been a canary in a coal mine with respects to unbound sulfites in alcohol and suffice it to say, I’m not a fan of the additive. It has ruined many a cider/beer/wine for me due to my lungs closing up. But why the use of a filter soaked in sulfites in the first place? When a cider is fermented dry, there is little fear of the cider/bottle of cider becoming unstable because all of the sugar in the cider has been consumed and turned into alcohol. If cider is bottled and has both alive yeast and sugar, the cider will continue to change in taste as the yeast convert the sugar to alcohol and more carbon dioxide is being created, which has been known to cause exploding bottles. In this situation, the sterile filter was being used because the cider was going to be backsweetened (the addition of sugar after fermentation) with apple concentrate to give the final product some sweetness (Americans love sweet). To recap: Backsweetening + yeast= off flavors and potential explosions. Backsweetening + filter + sulfites= a sweetened cider with less fear of re-fermentation. What does this have to do with sorbitol and watercore? A higher presence of sorbitol in a cider means my cider can be fermented completely dry (free of sugar) while maintaining a minimal sweetness without fear of re-fermentation. Eliminating this fear of re-fermentation means that I can eliminate sulfites from the back end of my cidermaking process. Watercore= Higher Sorbitol Content= Residual Sweetness in a Dry Cider With Less Chemical Inputs. ding. Ding. DING! Ok, so let’s say that I’m sold on experimenting with this sorbitol/cider thing and I want to grow fruit in order to make this product. Being in the South, I have a lot of hope for achieving such a thing because the causal agents are: Intense heat, lots of sun (sunburn), low calcium, droughty conditions, and genetics. In designing an orchard and keeping sorbitol production in mind, I would entertain the idea of going towards more of a dwarf set-up, perhaps even a trelli$ set-up on a southwestern facing slope. We’re talking steaming hot, dry, with the trelli$ed fruit being exposed to intense sun. On top of that, the apple system would be on irrigation which would allow you to regulate the amount of water and when to apply it. I’d also layout the orchard in a way which would drain quickly (maybe even a keyline design ;-)). 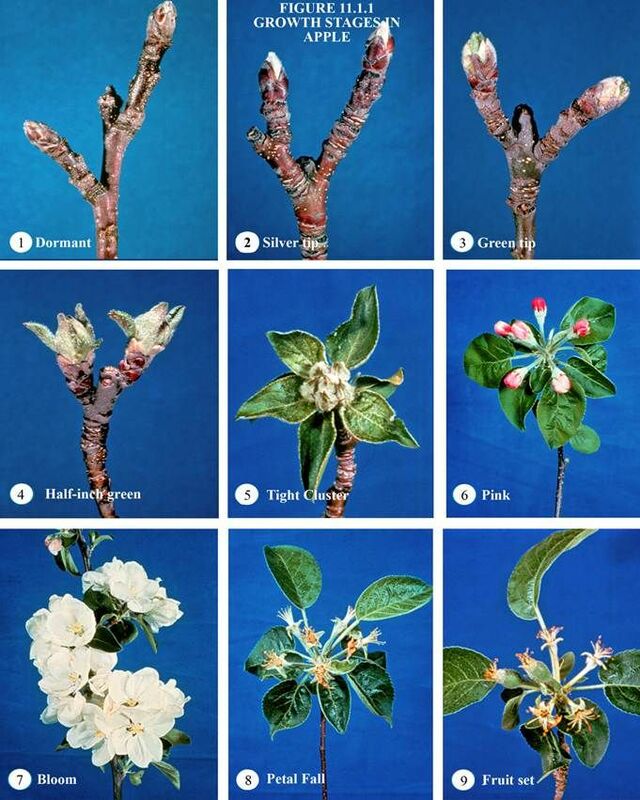 Next, I’d choose varieties which are prone to watercore and also those that tend to hang on the trees rather than drop (which is a good genetic trait for apples in the South, anyways). Apples heading towards being overripe are at risk of watercore, so those that hold on are perfect candidates. If you wanted to experiment with trying to intensify sunlight into a non-trellised tree, I would still try and have super quick water drainage off your site and have a SW aspect, but you could also try some extreme things like spraying all the leaves off your tree in late summer. I’ve done this for reasons of reducing vigor by using a 501 biodynamic prep, which I sprayed in late summer and managed to burn a BUNCH of the leaves off the tree…on purpose. I think the trick with this is in having a very vigorous tree and also determining the point of no return for apple ripening (if such a thing exists). The spray I applied in mid-August slowed the ripening scheme, which doesn’t help my sorbitol thoughts. However! It makes sense to me that reducing the leaf load on the tree would certainly help the sun scald situation. I’ve never heard of anyone trying to grow apples with watercore on purpose, but why not? In straying from dessert fruit growing, managing for a certain product like cider could give regions like the South a distinctive taste in their products. We often think about this in terms of varieties and landraces, which are certainly a part of it. But let’s try and capture our environment and create a truly unique product which describes our place in every way. A long time ago, orchard and nursery people often grafted scions from known cultivars onto dug-up root pieces from apple trees. This was one of the ways in which orchardists and nurserypeople were able to propagate specific varieties rather than getting something completely random from seed. The other way was to graft onto existing trees (called top-working, or top-grafting) or onto rootstock produced by planting seeds. *Disclaimer* I have heard from a smart orchardist outside of Pittsburg who is growing black raspberries on the same trellissing as his high density apples with wild success. Yes, these trees are often times very large compared with apple trees grown on clonal rootstocks. Yes, they are going to take 10-10+ years to bear fruit. I’ve seen a lot of old apple trees in my lifetime, like the one pictured above which is over 200 years old! That tree was root grafted and, as a result, on it’s own roots. 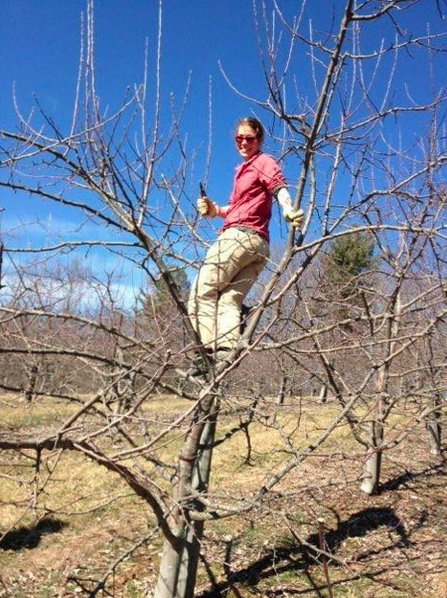 The Fruit Explorers, a group of which I’m a founding member (along with Pete Halupka of Harvest Roots Farm and Ferment), traveled around the South last year looking for all sorts of apple trees. By far, the healthiest trees we found were those on standard rootstock or growing on their own roots. We were in the hot, humid, zone 7a-8a South which is known for all sorts of rots, fireblight strikes, fungal infections…you name it. And the trees that looked the best were the big ones. All of this observation caused me to believe that we probably have the best chances of growing low-input trees if they are on big roots. I can grow other crops in the rows between the trees. I can graze animals. I can have a diversified income stream while waiting for the orchard to come into bearing and for the canopies to narrow the rows. Who’s to say these trees won’t each drop 100 bushels of apples a piece? This year, I ordered 1000 southern crabapple trees from the Maryland State Nursery (Malus angustifolia). I decided on M. angustifolia because I’m in the South and these crabapples are better adapted to this hot and humid climate. Also, I had already decided that I wanted standard sized trees, so why not use them as a rootstock? Well, after I ordered them I did some digging and realized that M. angustifolia, which on average is not that large of a mature tree (maybe 20 feet), would probably not be able to handle the vigor of the heirlooms and cider varieties I wanted to graft. Across the boards, from writings I found in the 1800s to anecdotal quips from friends and thoughts from mentors, it seems like the majority of these seedlings would only be able to handle the graft for a few years and then the top would eventually outgrow the bottom, resulting in death. The success stories I read involved topworking mature, already-in-the-ground-and producing-crabapple trees OR grafting onto crabapple stock from Russia. Russian crab stock is more vigorous and able to handle the older varieties and I’ve seen evidence of this in very old orchards in Maine, where the cultivar died out and the crab stock bolted upward. Compared to the Siberian crabapple stock we ordered last year (Malus baccata), this year’s rootstock was tiny and we were left trying to figure out how we were going to graft it because on average, our scion is larger in diameter than above the root collar. That’s when I settled on the idea of root grafting. This is a larger example of a the M. angustifolia crabapple we received from Maryland. I use a foot powered saddle grafter much of the time to save my hands because I battle carpel tunnel due to repetitive orchard/nursery movements combined with being on the computer too much of the time. This is what we’ve done to many, many crabapple trees. We took the root, made a grafting cut (some whip and tongue, many saddle, some omega and some cleft). Roots are often difficult for me to graft because many of them aren’t straight, but squiggly. This is where the saddle grafter came in handy, or we employed the cleft graft. We left the scions larger when grafted. Usually, you only need a bud or two for grafting but I decided to leave 5-6 buds for reasons I’ll tell you about later in this post. By itself, horticultural rubber bands will degrade in the sun and fall off the tree within a certain time period so you don’t have to worry about it girdling the tree. 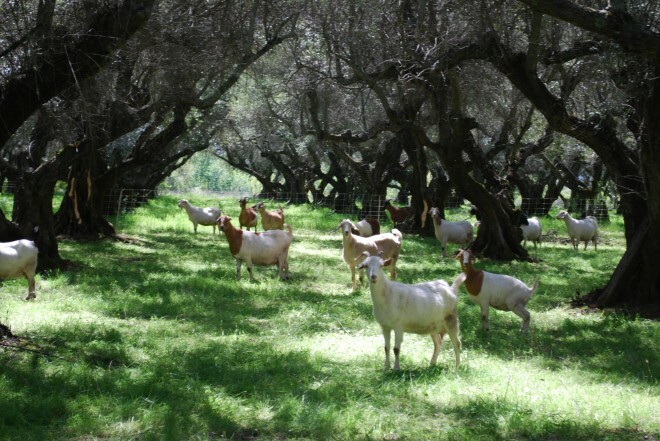 By itself, parafilm will also degrade/expand/drop off a tree later in the season without it girdling the tree. TOGETHER, however, your tree is doomed for girdling unless you manually get out there in the summer and cut it off in time. I learned this the hard way, folks. Why are we using this rubber band/parafilm method for grafting a root when I won’t be able to cut it off due to it being buried in the soil? Well- the answer is this: I want the girdling. Before I put this all together for you, I need to go on a brief tangent (which connects, I promise). Last summer, we visited with Jason Bowman of Horne Creek Historical Farm (one of the sites that has Lee Calhoun‘s entire collection) and he was kind enough to take us through the orchard. Every year, I notice something different about trees and during this particular visit, I noticed how tree form differs from cultivar to cultivar. This is nothing new, really, because I’ve pruned many different cultivars of apples and they are all different. But this time, my knowledge of what trees had better disease resistances combined/confirmed with Jason’s were overlayed with tree form. I started to notice how apple varieties like the Dula Beauty naturally had wide crotch angles, creating better natural airflow and therefore, less fungal problems because humidity wasn’t being trapped within the tree as readily as some other varieties. Keeping this in mind, I’ve been wanting to return my most disease resistant cultivars with excellent tree form (wide crotch angles) to growing on their own roots because I think they will require less pruning down the road (which is one of the big arguments for going to smaller trees…less and faster pruning). I want to see what size these trees will be without interference of rootstock, how many bushels of apples these trees will bear, and I want to taste an apple on it’s own roots as compared to another rootstock. That’s why we’re grafting in a way which will eventually have the root girdled from the scion (by using the rubber band/parafilm method). Alone, it’s fairly difficult for an apple cutting (scion) to produce roots on it’s own, so that’s why we’re grafting it to the crab roots. I want this crab stock to be a nurse to the scion, keeping the scion alive and fed while it starts to produce it’s own roots, and then to die off! 1.) We’re going to plant the whole thing and leave 2-3 buds sticking out of the ground. There will be irrigation. 2.) We’re going to plant the root and the graft union, and then cover the soil with several inches of sawdust which will be under irrigation. The area where damp sawdust contacts the scion should encourage root growth into that space. When the time comes for digging these trees up and transplanting them, in a year or two, we may cut off the crab root if it’s still attached and alive. We’ll see! Updates to follow whenever we dig these things up (starting in the winter of 2016/2017).